As part of my fellowship I began a research project offering training in US guided peripheral IV insertion to our ED RNs. 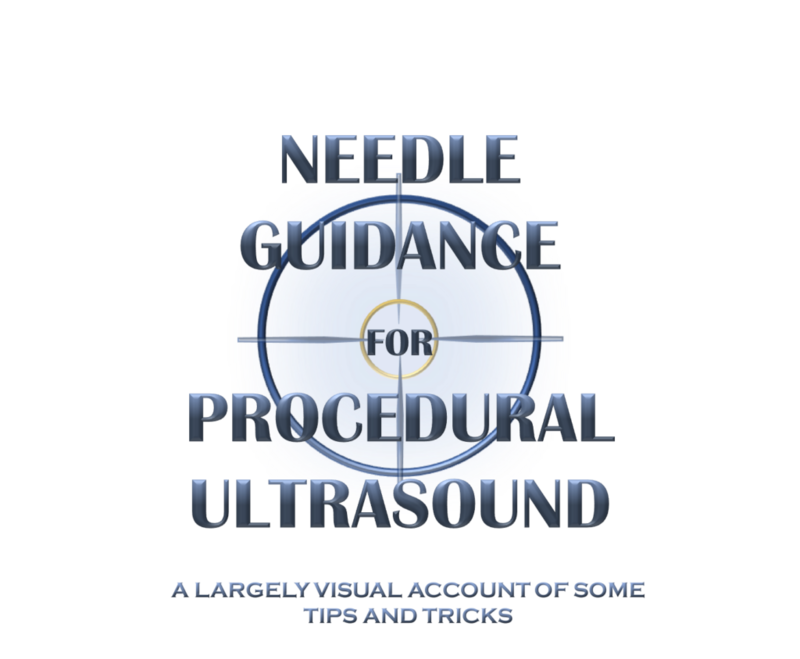 This post is a collection of techniques to aid needle visualization that we as a group have found helpful, they are all initially described in regards to vascular access but the techniques can be extrapolated to aid other procedures requiring needle visualization with US. … if not at least they are fun to make! Ultrasound lets you reach deeper but be sure you leave enough catheter to lie securely in the vessel. that interstitial infusion may be initially occult, be vigilant and remember the geometry. Our angiocaths max out at 3cm, remember you have to account for the depth and the runway. might not produce the best image of your needle. Try heeling the probe slightly towards your needle to improve your needle visualization when using an in-plane approach. Bounce lightly on the skin to ensure you are centred over the target. Reposition as needed before advancing the needle. Even better just slide the needle under the gel and save the patient the scout-pokes! Unlike the IJ, peripheral veins collapse with frustrating ease under just the weight of the probe. the patient’s arm to allow fine control. Use lots of gel and float the probe…. (suggesting you went through the target). Sweep back slightly with the probe to allow the needle to be introduced. You can increase your angle once you are happy you have the tip in sight. The ‘SKI LIFT’ technique was described in 2010 to allow better visualization when using a long axis approach. Keeping a mm thick US beam in line with a mm thick needle can be tricky. 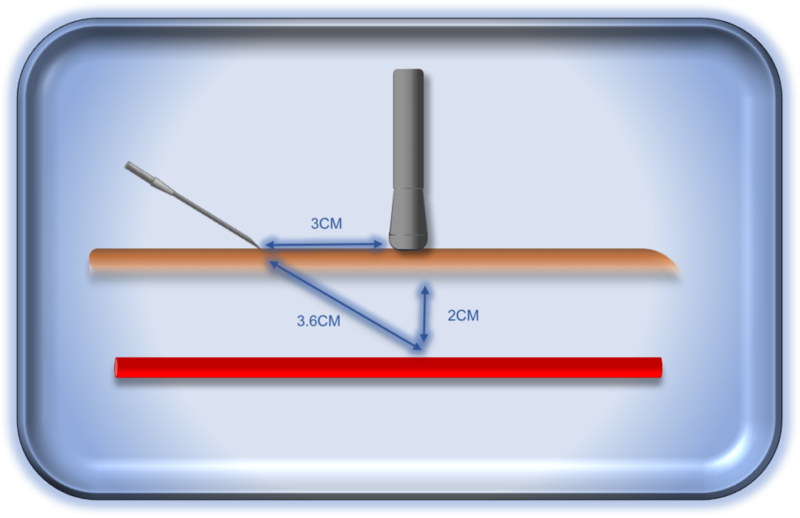 Try lifting the proximal end of the probe and laying your needle in perfect long axis beneath it to improve your starting view. We have found the ‘walkdown’ to be the best way to ensure needle tip visualization in short axis. then slide a few mm ahead with the probe and repeat. Repeat this maneuver and steer down towards your target following the tip the entire way. 1. Stolz LA, Stolz U, Howe C, Farrell IJ, Adhikary S. Ultrasound-guided peripheral venous access: a meta-analysis and systematic review. Journal of Vascular Access. 2015. 16(4): 321-326. 2. McNamee J, Jeong J, Patel N. 10 Tips for Ultrasound-Guided Peripheral Venous Access. ACEP. 2014. 5. McCarthy ML, Shokoohi H, Boniface KS, Eggelton R, Lowey A, Lim K, Shesser R, Li X, Zeger SL. Ultrasonography Versus Landmark for Peripheral Intravenous Cannulation: A Randomized Controlled Trial. Annals of Emergency Medicine. 2015. A very useful website. Thanks a lot. I’ve been working in ICU 13 years but recently found frequent unsuccessful ultrasound guided central venous catheter insertion. I used to adopt the transverse view of the vessel and then insert the needle with the Pythagoras’ help. I will see if there is any improvement by adopting the tuck down and walk down approach. By the way, would you recommend me to stand on the head of the bed or on the same side as the vessel when puncturing the internal jugular vein? I used to stand on the cephalic position but some of my colleagues stand on the side. Hi Hannah I’m glad you found the post helpful! The tuck under and walkdown approach is my go to for peripheral veins (most often I find the basilic vein about 2-3 cm proximal to the anticubital fossa is well preserved in vasculopathic patients), I agree that the long axis approach is often difficult in the peripheral veins as they are torturous and it is difficult to keep the vein and IV in a perfect plane while dealing with such small structures. I will still often use the long axis view to confirm my placement and to trouble shoot an IV which isn’t flashing back. As for IJ line placement, I am with you in that I stand in a cephalic position so that my sight, the vein to be cannulated and the display of the US are all in one plane. this is especially helpful when using short axis/walkdown as it allows a more natural set of movements while walking the tip down (the analogy to me would be trying to drive a car while sitting sideways!) If using the long axis approach it could be more useful to be on the side for the same reason (ie. your line comes in from the right and also appears from the right of the screen). If using the long axis approach I recommend trying the skilift technique, the original publication is cited in the article and there is a brief description with a video here: http://takeokun.com/blog/2015/12/4/the-ski-lift-a-technique-to-help-with-ultrasound-guided-access. Hope that helps and happy cannulating! Wow you made Great Job !! I’m EMP in South Korea and one of my major is teaching US guided procedures. It is the most awesome video I ever saw about needle visualization tips. Could you please allow me to introduce your posting? I want to quote the videos. I will mention about this web address and the author.